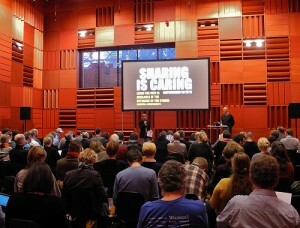 The 1. international “Sharing is Caring” seminar held on November 11th, 2011 in DR-byen, Studio 4. This webpage is kindly hosted by FORMIDLINGSNET, the online network for Danish educators. Below you will find links to the presentations on Slideshare, videos on Vimeo, photos on Flickr, related blogposts, and more. How do we create value through the digitized cultural heritage? By sharing it and making it accessible. The purpose of the seminar was to bring together library, archive and museum professionals to discuss the preconditions for establishing a free and common access to digitized cultural heritage. The speakers shared their insights into the technical requirements and provide inspiring examples of how together we can create synergies between digitized cultural heritage collections. What would you do if a group of citizen activists bought and ran your organization? You should decide quickly because they already have, and they are using your collections and scientific data to do remarkable things. In this presentation, Michael Edson will talk about the forces driving organizations towards greater openness and the tactics they can use to be on the winning side of change. Creative Commons develops, supports, and stewards legal and technical infrastructure that maximizes digital creativity, sharing, and innovation. The infrastructure Creative Commons provide consists of a set of copyright licenses and tools that create a balance inside the traditional “all rights reserved” setting that copyright law creates. Creative Commons tools give everyone from individual creators to large companies and institutions a simple, standardized way to keep their copyright while allowing certain uses of their work — a “some rights reserved” approach to copyright — which makes their creative, educational, and scientific content instantly more compatible with the full potential of the internet. The combination of Creative Commons tools and users is a vast and growing digital commons, a pool of content that can be copied, distributed, edited, remixed, and built upon, all within the boundaries of copyright law. The Swedish National Heritage Board (SNHB) is one of many cultural heritage institutions busy dealing with issues facing a rapidly changing media landscape and what we need to do in order to be relevant in such a context. What happens now when we are acting on a global arena? The Board is concentrating on improving openness in two ways. One is to open up and expose the knowledge and passion that exist in culture heritage institutions via new media. Finding and building relations with the audience and new users through social media sites has proven to be successful. Another way is to set digital information free. Cultural institutions can benefit from a greater use of information, and allow use in new contexts. SNHB main objectives now are infrastructure for aggregation of museums and immobile cultural heritage, building and marketing APIs, implementing Creative Commons and PD mark, phase out trading photographs, building tools for linking data and implementing semantics into the systems. We are also involved in implementation of social media channels as tools for listening to and communicating with stakeholders. TING Community defines itself as an Open Ecosystem for cultural innovation, cooperation and sharing of results in the digital society. A main goal is to create and share relevant digital solutions for libraries, museums and other cultural institutions and their end users. This is not possible if we do not release information, knowledge and digital representations of physical collections and make it visible in contexts with a high degree of relevance to the public. Sharing development based on Open Source, Open Content and Open Access was a main driver when the two biggest public libraries, Aarhus and Copenhagen, together with Danish Library Center formed TING. So far, a Drupal™ based discovery interface and CMS based platform have been developed and shared. The presentation will focus on how these can be shared in the long run together with new development, and in cooperation with other Open Source projects, for instance Collection Space. What characterizes a sustainable digital project? How do we create projects that aligns with our core acitivities, not creating new ones that lead into dead ends? How should we act in the midst of tech hype and the draw of the latest one-trick pony? What is the “cemetary of dead frontends” and what is burried there?! What should we do to prepare for digital heritage sharing and collaboration beyond the 2010’s? All these questions will be adressed using the LAM-project (libraries, archives, museums) http://historiskatlas.dk as case. The Cultural Heritage Project is working in a community to assure use of our heritage through Free and Open Source Software. Sharing experiences from the work done in building the Cultural Heritage Archive Open System and the CHAOS:\Community, Tobias Golodnoff will give insights of the reasoning behind working together in a technology community, and why being ready is everything when the next new thing makes our audiences demand innovation in terms of digital services and products. Museums have a very long tradition for collecting, recording and for sharing knowledge. Some were early adopters of computers and Denmark is in the unique situation that it has been possible to establish a framework at the national level for giving access to the Danish museums’ collections 24/7/365 using the internet. So far not every item or artwork is digitised and a few museums are still missing from the national overview. Simultaneously, new possibilities for sharing information are rapidly emerging. The Ministry of Culture has just initiated a consolidation process for a new common infrastructure for collections management, digital resource management and aggregation to be used by all museums within 3 years. The work includes a new shared data model, a new database as well as new applications. Collaboration, involvement and innovation are among the keywords. The presentation looks at the process leading to new system, gives a status and outlines some of the future possibilities among others for sharing and caring. Museums constantly write and produce educational texts, and increasingly also audio and video. Often, the different texts and files are only used on a single platform, for instance on a website, on exhibition labels, or in printed publications. A new initiative will collect all kinds of educational texts and files in a shared database in order to make the content scalable and reusable on a number of digital platforms, and add data from Regin, the central register of Danish museums. The first platform to be developed is a smartphone application, made in collaboration with the DR Cultural Heritage Project.